· Support 65ft HDMI 1.3 cable at the TX input, and 65ft cable at the RX output. · Support up to 200ft of CAT5e,6,7 between the TX and RX unit;. Support HDMI1.3v & 1.2 signal (10.2Gbps/deep color 36bit/xv-YCC/1080p24fs/dts-HD) for 200ft transmit via CAT5E/6/7 LAN cable. Zero Video Latency. 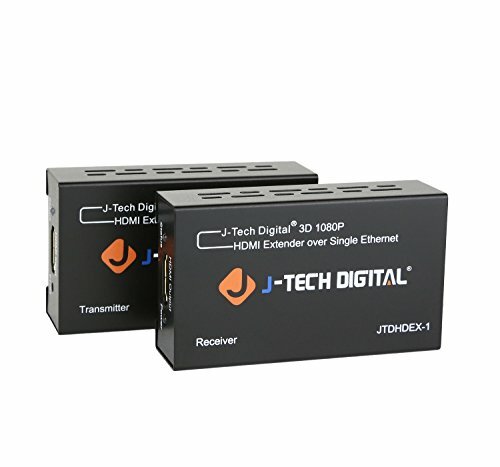 NOTE: We recommend using direct HDMI to HDMI connections, avoid using signal converters/adapters at all costs. Support Video Color: 36bit(CAT7); 24bit(CAT6); Supports 2-channel PCM audio only. Supports Dolby Digital / DTS pass through if copied EDID from right display devices. Support up to 200ft between the TX and RX unit; For better picture quality and longer distance transfer, we recommend to use Cat 6 or Cat 7 cable.